Voice your opinion! 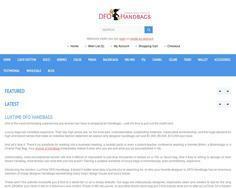 Review LuxTime DFO Handbags now. Hi Ray, My delivery arrived quickly and everything looks great. The bag looks just like the pictures and I can’t wait to use it. I Will definitely be ordering from your site again. Is LuxTime DFO Handbags your company? LuxTime DFO Handbags is the world’s number-one source of high-end, name brand designer bags on sale cheap – discount designer handbags are always on sale.